MacBook Air, the smallest and the lightest notebook from Apple, is all set to get Intel's latest Sandy Bridge line of processors in the coming months, according to TechTree. The Sandy Bridge processors are Intel's next-generation 'i' line of processors, and will increase the processing and graphics performance of the MacBook Air notebooks. Although the MacBook Air has always been sleek and ultraportable, it currently lacks power and performance. However, the new processors will rectify this. The MacBook Air now available in the market features Intel's Dual Core Processors, with 1.4GHz and 1.86 GHz configuration in the 11 inch and the 13 inch model respectively. The Sandy Bridge processors will increase it to 1.7-1.8 GHz, which can be further increased to 2.9 GHz with the help of the turbo boost feature. As the Sandy Bridge processors are smaller in size, compared to the regular ones, one can surmise that the smallest notebook by Apple will get even smaller. The Apple MacBook Pro and the iMac already feature Sandy Bridge in the form of Dual and Quad Core processors. But in all probability, the new processors to be used in MacBook Air won't be as powerful as those. 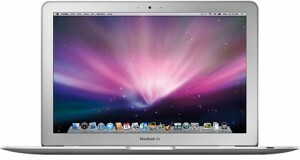 The updated MacBook Air is expected to be launched in the second quarter of this year. Other laptops featuring Sandy Bridge processors include Samsung's 9 series.